In the dramatic and gorgeous landscape of the bay of Naples sits a tiny appellation dedicated to the production of sparkling red wines known as Gragnano. These red wines have found a cult popularity in Naples, where they are guzzled with joy and abandon, especially in the most sacred of Neapolitan dining institution--La Pizzeria. But the town of Gragnano's fame does not end there--it's also renown for the production of dried pasta, and many epicures consider it the source of Italy's finest macaroni. Our friends at Iovine have been making wine on the Sorrentine Peninsula for four generations dating back to the 1890s--they own approximately 15 hectares between Gragnano, Lettere, Irpinia and the Beneventano, but Gragnano is their strongpoint. Their vineyards there were planted in 1963 on original rootstocks--they are all ungrafted Vitis Vinifera Europea, as phylloxera cannot survive in these soils. 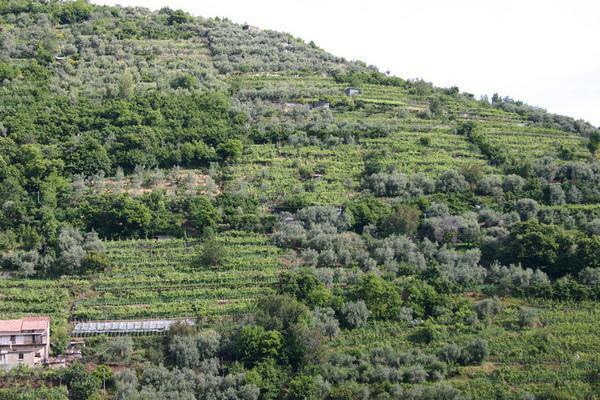 The vineyards are steep and terraced into volcanic soil at elevations from 200 to 450 meters above sea level. With grades reaching 45%, naturally all work is done either by hand or by mule during harvest!